Although Wesley, my 6-year-old son, had scouted areas in the past with me this was his first overnight trip. Before, I’d spent most of my time just watching him and making sure that he didn’t try to catch a snake or swim in the pools of a creek. Like most children, my son loves the outdoors. And, like most fathers, I believe growing children should get plenty of exercise and fresh air. With present day video games and movies, children tend to stay indoors and miss experiences that will make up their childhood. Computers are in the present and air and muscles need to be built–through play and activities the outdoors provides. My first mistake was in telling him of the upcoming trip on a Monday, instead of waiting until the day before we left. All week I heard of how much gold we would find and how rich we would be. The dreams grew as the weekend drew near. At last, Friday night arrived, and he was bouncing off the walls of the house! After his bath, I allowed him to stay up for a few hours, in hopes that this would slow him down enough to sleep that night. Long since forgotten was my first trip, but the excitement showing in his young face, and knowing that this trip would be a very special one, I began getting just as excited as he. An hour and a half later, we arrived at our chosen area. We began unloading the equipment, but I knew that the best plan would be to set up camp first. There were threatening thunderstorms off in the distance. It was the logical thing to do. So, with the help of a six year old, the pitching of the tent started. Alternately taking photographs and trying to dig is not a job for one father. I soon found that this man who had no better sense than to take a small boy prospecting could not watch the child, focus the camera, and watch for snakes all at the same time. How many times had I answered the hundreds of questions about snakes, and would there be any where we’d be? Well, I found out that two minutes after arriving the whole idea of snakes was forgotten completely. Suddenly noticing that something was missing, I began searching for my son. I found him with his mouth stuffed with cookies. That’s when I found out that any time there was peace and quiet, something was wrong. After telling him that it was not time to eat, and retrieving the “soon to be extinct” cookies, I found him a military trenching tool and started him on his first dig. I decided that would be a good time to find a safe hiding place to stow the food. When the food was safely stored, I turned my thoughts to setting up the camp. I unrolled the sleeping bags and built the traditional campfire ring. I decided that helping me gather firewood would take his mind off food and maybe give him something to do for awhile. Using a length of rope, I pulled dead limbs from a nearby tree and started breaking them up for the fire. Wesley helped as much as he could and for a change he began to really pick up an interest in what was going on around him. Showing him about building a fire and how to stack the wood, he was all for starting the fire right then. I explained to him that we would light the fire, but only when the sun went down, because of a lack of abundant firewood. I knew that the only way that we were going to get any prospecting done would be to calm him down a little. I thought of letting him play in the creek, so we removed his clothes, and replaced them with his swimming trunks. He ran and jumped in a pool about six inches deep. He ran back out just about as fast as he’d run in, complaining about the temperature of the water. “Dad, that water is cold.” “I know, but we have to get used to it so we can work”, was my reply. Satisfied somwhat with my answer, but not with the cold water, he would play in the water until his lips turned blue and then run around camp until his blood started circulating again. After an hour or so of splashing through clear Georgia mountain water, my energetic son had had enough. Rinsing off the mud and sand, I dried him and he dressed. Once in his “camping clothes,” we started our digging. Have you ever watched your son imitating the things you do? I watched Wesley as he dug into a sandbar and then later as we classified the material. Panning was a different story…After a frustrating hour and dozens of attempts, “By George, I think he’s got it!” I could feel pride in my son. We worked side by side on the sandbar. Of course all the panning was done over a tub. 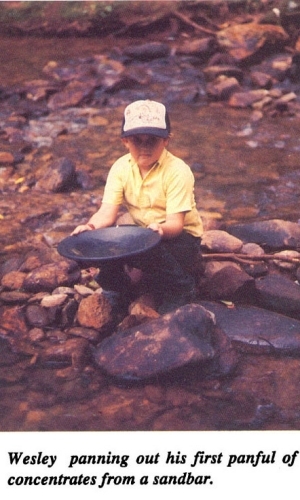 Although we didn’t find any gold, we were determined to find it the next day. Our plan was to work harder and not to play as much. Evening was coming and we stopped our prospecting to light the fire and eat. I sharpened a couple of green sticks and we began roasting franks over the fire. When it came time to eat, however, there was an objection raised by my son, about the fact that ashes had landed on the franks. So, Wesley ate uncooked franks and chips. Well, so much for roughing it. I watched the fire, as men have done for millions of years, with their sons, and thought of how good it made me feel to have this time with him. As the pile of wood grew smaller and the darkness drew nearer, Wesley changed for bed. Crawling into his sleeping bag, he told me goodnight, and asked me to turn the lantern off, it bothered him. This from a boy that the night before, had insisted on having a nightlight at home. I smiled as I turned the lantern down. My son was throwing off some of his childhood fears and had grown some. As I lay in my sleeping bag, I watched as the last flames of the campfire died, and I thought of how much my son had learned and the satisfaction of being the one to teach him. I drifted off to sleep. About midnight I woke to thunder and lightning, with rain leaking in through the screen. I got up and zipped the fabric door. Returning to bed, I returned to the land of dreams. I was again wakened by yet another storm, and sat up for awhile, realizing that this was a series of storms. I decided, after feeling the runoff flowing under the tent floor, to check for leaks. There were no leaks, but the lightning was striking so close that I decided it was time to pack and leave. Waiting for the rain to slow, I grabbed my son, still wrapped in his sleeping bag and put him into the cab of the truck. I broke camp and started the trip home. As we drove, I realized the decision I’d made was the right one. We passed through storms all the way, and it rained all the next day. We had found no gold, but next time…we would bring our dredge and…well, that’s another story. My son and I hope to see you and your family sharing an outing together soon.